You can help us meet routine and unexpected operating expenses. Simply click on the DONATE button in the side bar to make your one-time, monthly, or annual contribution. Help feed and care for the animals at the Miller Island rescue. If you prefer to mend fences, pick-up and deliver feed, or assist with fundraising – we always need more hands. 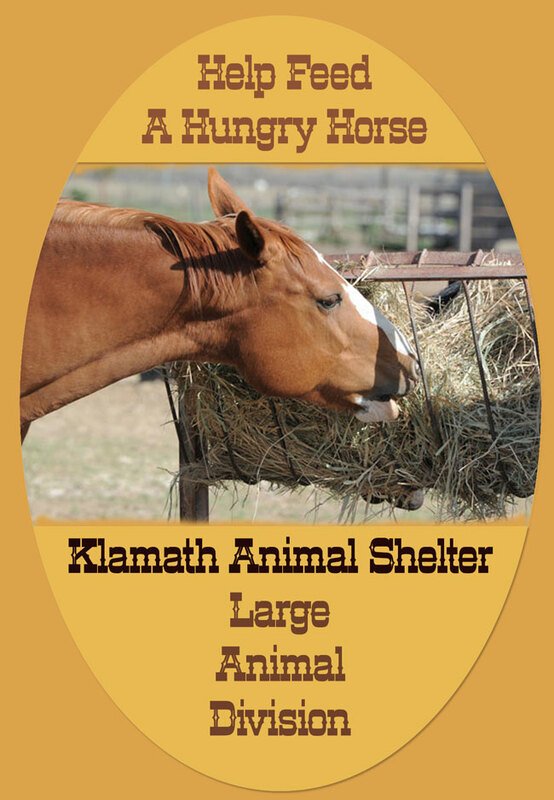 Contact the Klamath Animal Shelter/Large Animal Division Barn Manager – Laurie @ 541-539-7879. Our horses are always hungry. Donations of hay, grain, and supplements are greatly appreciated. We need lumber for fencing, sand for corrals, and tack for starting horses. Finding forever homes for our horses is paramount. If you are interested in adopting a horse, click on the Adoption link for information on the process and an application. If you have limited time, space, or finances – sponsoring a horse can help provide the care it needs to recover from starvation, neglect, or abuse. Follow the Sponsor a Horse link to get started. By pooling your contribution with your friends and family, a rescue team can ensure that our horses fully recover. Use your email and social media accounts to encourage others to help. Amazon will donate .05% of your purchase price to your favorite charity. Include Klamath Animal Shelter/Large Animal Division in your estate planning. Klamath Animal Shelter/Large Animal Division provides a safety net for abused, abandoned, and neglected large animals. Our volunteers foster responsible care and compassion for large animals through community outreach, intervention, and education. When alternative care is need for large animals, we work closely with the Klamath County Sheriff’s office and other local horse rescue groups to provide rehabilitation, training, and re-homing services.